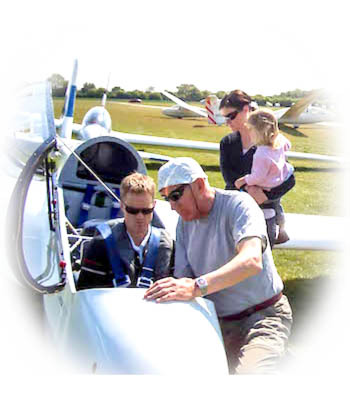 A Families’ Gliding Experience consists of a single winch launch for each four people leading to soaring flights of approximately 8 to 10 minutes. 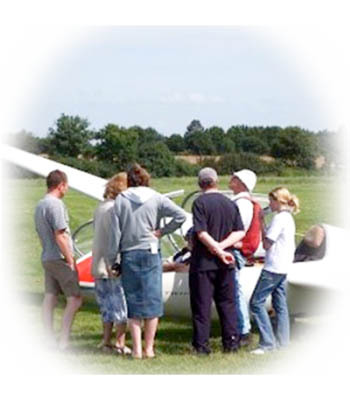 This is aimed primarily at giving a family group an insight into gliding, but the group may comprise family members and/or friends. Time in the air is very dependent on the time of year and the weather conditions at the time of the flight. Flights must be booked in advance and all participants must be booked for the same date and time. Upon booking you will be advised of the time you should arrive at the airfield, BUT this will not necessarily be the time you will fly. The club is often busy and Gliding Experiences may be slotted in with other flights; therefore you should be prepared to be at the club for at least a couple of hours or so. Gliding is very much a co-operative sport where everyone helps each other and you are welcome to join in. 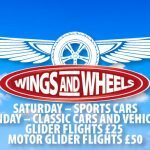 Your flying tuition will be in one of the club’s two-seater gliders with a British Gliding Association qualified instructor, who will give you a full briefing before take off. A Couples’ Gliding Experience consists of a single winch launch for each of two people, leading to soaring flights of approximately 8 to 10 minutes. Time in the air is very dependent on the time of year and the weather conditions at the time of the flight. Couples’ Gliding Experience flights must be booked in advance. Both participants must be booked for the same date and time. Upon booking you will be advised of the time you should arrive at the airfield, BUT this will not necessarily be the time you will fly. The club is often busy and Gliding Experiences may be slotted in with other flights; therefore you should be prepared to be at the club for at least an hour or so. Alternatively you may send us a cheque, call in to the club and pay by cash or call Miriam Konieczna at our Booking Office directly on 0748 6438934 for more information.